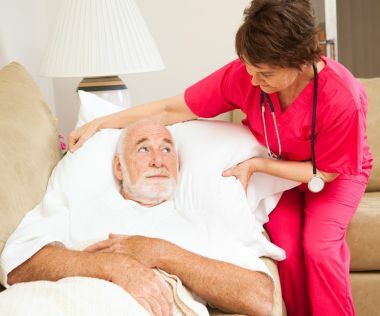 Home health nurse fluffs an elderly patient’s pillow. Make no mistake about it, we will all die someday. When, how and where we’ll die, we have no control over, but it is certain for humans to live then ultimately die. I’m not afraid of death; I was once asked what motivated me ad my answer was “death”. I always say “to heir is human and to die is our ultimate fate”. This reminds me of certain major principles in life and helps me live the full life I’ve been blessed with. Since we all die, have you ever wondered what you would say on your death bed? Are you going to have regrets? If you were to die today, what would you say? Wish you had spend more time with family? Wish you had loved your kids/spouse a lot more? Wish you hadn’t spent so much time at work? Wished you would have called your friends or mom more frequently? To be honest, these are some of the questions I ask myself whenever I think of death. I’m not afraid of it, so I think about it and it motivates me to do more and achieve more. Remember my answer was “death” when I was asked what motivated me? It was a sincere answer because death is the constant denominator of our lives – we will all face it someday. The fact that I will die fuels me to live in the now and enjoy every opportunity presented to me. The fact that I would die or my mom will die someday allows me to sacrifice some of my “precious” time to enjoy her presence. My dad died of prostate cancer three years ago and even though he died singing of my praise of how good of a son I am, I wish I had spent more time with him. He appreciated the fact that I worked from the hospital when he was there for three days for cancer treatment, but I wish I were there with him before he got sick. My dad’s passing opened to my eyes to life, gave me a sense of purpose and gave me the courage to be motivated by our fate as humans – death. It gave me the opportunity to love people deeply, work smart, take vacations, enjoy moments with friends and be a difference in the world. No one on their dying bed has ever uttered the words: I wish I had worked longer hours. I wish had not forgiven him/her. I wish I had ignored my wife/husband and kids a lot more. I wish I had spent less money and time on my family. It’s interesting how when we face our ultimate end on earth, we automatically become the people we are meant to be: forgiving, loving, relational, selfless, content, generosity, reasonable, etc. If you’ve noticed, these are the very same traits which promote good health and happiness irrespective of life’s challenges. On my dying bed, I want to go in peace with no regrets – but as human as I am, I look at what I could say and make life changing decisions to impact my behavior and help me become a better person, not only for myself, but for the rest of the world. Below are some of the regrets most people have on their dying beds and how they motivate me today. Wish I hadn’t work so hard – People often spend more hours at work they they spend with their families. I can be a workaholic at times but I am learning how to put work on hold and enjoy the fruits of my labor. Believe it or not, your company will move on without you. I’ve been traveling a lot lately and I have been tired to the point of almost getting sick, so I decided to simply take the day off today to rest, read and write and I will not regret it. Wish I would have forgiven a lot more – To heir is human. As humans we are all faulty by default, hence you are bound to be hurt by another individual. The hurt often imprisons us but forgiveness sets us free. Forgiveness also helps you physically. A research recently completed shows that about 60 percent of cancer patients had a problem with forgiveness. Some doctors are now including “forgiveness therapy” for cancer patients. This is not to say that every cancer patient is struggling with unforgiveneess but rather, to help us understand the potential side effects of not being able to forgive. Dr. Michael Barry, a pastor and author of the book The Forgiveness Project describes the negative impact of not forgiving: “Harboring these negative emotions, this anger and hatred, creates a state of chronic anxiety. Chronic anxiety very predictably produces excess adrenaline and cortisol, which deplete the production of natural killer cells which is your body’s foot soldier in the fight against cancer.” The next time you think about what could say on your death bed, learn to forgive. Wish I had stayed in touch with my friends: We often forget the importance of good friendships in our lives because we are busy chancing dreams. Dreams are good and they should be chased, but in the process of doing so, learn to take a step back and connect with your friends. What is the point of getting to the top and not enjoying it with those who were there for from day 1? I try to stay in contact with friends through social media and invest in our relationships by attending their events. Not all friends will do the same for you, but it has to be sacrificial. Wish I had the courage to live a life true to myself and not what others expected of me: If it were left to my parents alone, I would have been a doctor by now. Yes, it’s a prestigious job, but I did not have the passion for it. At a very young age, I learned that if I were going to be happy, I had to make certain decisions for me and not follow the crowd or live the dreams of others. People will always have expectations of you – some are realistic and some are not. Take advise but ultimately do what is for you and you will have no regrets. I’m not a doctor but I work for a prestigious company and I am happy. Wish I had spend more time with family – Family will always be there. After my dad’s death, I promise myself not to allow bad news to prompt me to visit my family. I should visit my mom and siblings just because I miss them and not because they are sick. I should take a day off and spend time with my mother and I should be the best family man I can be. Losing a family member is difficult and since our days are numbered, we ought to do a better job enjoying their presence. What life changing decisions are you going to make today to impact what you could say on your death bed? Share Your Thoughts, Share This Post!